I’m a little out on a limb with this one, but I’ve had the thought lately that, as AI gets inevitably more and more powerful, and is therefore in charge of producing and maintaining more and more complex objects in the world, that it will simply be beyond human comprehension to keep up with the design and repair of those objects. Think about it… right now, in my living room, I have several pieces of audio/visual equipment that no one person fully understands. My amplifier is made of hundreds, if not thousands, of individual components, all assembled into higher-level components with well-known interfaces, which are, in turn, assembled into still higher-level components with their own interfaces, until we come to the whole thing as one unit. The fact that it functions at all (and functions very well, I might add), is somewhat miraculous. Someone at Yamaha knew enough about the highest-level components to assemble them into this unit, but then other people know how those components actually work, and so on until we get to the smallest pieces. And now imagine that on the level of nanotechnology-based manufacturing. When that comes (within 20 years), we’ll effectively be “3-D printing” our manufactured goods. Solar panels, computers, phones, vehicles, appliances, furniture – hell, lots of things – will be created out of a process that looks more like writing software than creating hardware, because the input to the manufacturing process will be a complex set of instructions and some raw materials, and not much else. That’s what “nanotechnology-based manufacturing” means… we turn hardware problems into software problems. And AI is going to be brilliant at solving software problems. So we’ll be living in a world where the very objects that we use on a daily basis are designed by an Artificial Intelligence so vast that it can solve these kinds of software problems easily, in a way that no human intelligence could do on its own. And, speaking as a computer programmer (which I’ve been since the age of 11), even today the software challenges we’re facing require new languages and new structures to express the complexity that we have to deal with… and those new high-level languages are relying on a significant amount of automation behind-the-scenes to enable the parallel processing and sequencing that is required on current and future hardware. And our ability as human beings to hold all of that complexity in mind, at the same time, is starting to show some seams in terms of programming. Very few people really understand the mechanics of how to do parallel processing well, and few understand even the new constructs that have been created to make that easier to do. I’m not telling you this as a sad story… I’m just noticing what is, and I’m also noticing that there’s a level of AI that’s just being birthed right now that will be able to pick up this ball and run with it. And when that happens… what will be left for us humans to do? When the complex tasks are more-and-more handled by AI, when the objects themselves are so complex that we can’t fully grasp them with our human cognition, what will we do? Roughly speaking, we’ll cede the right-hand quadrants to AI, because it’ll be way better at figuring out objects, measurements, and how those objects interact than we ever could. And we’ll have to start using our intuition to navigate the world, in the left-hand quadrants, because that’s what we’ll have that AI won’t, and because our intuition, when it’s sourced from the subtle and causal fields that we’re already drenched in, turns out to be a very elegant and accurate solution for navigating. 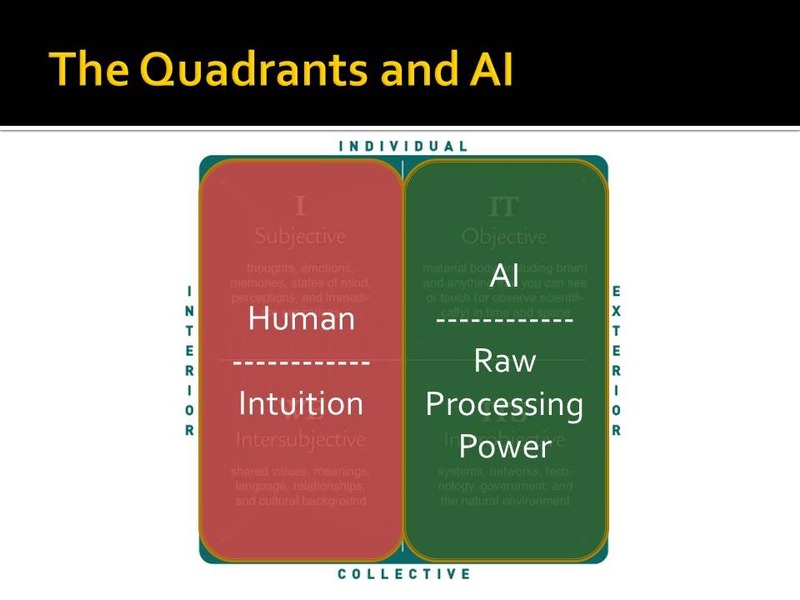 That’s not to say that AI won’t have the left-hand quadrants, or that humans won’t have the right-hand quadrants… all quadrants co-arise at the same moment. With that said, today, us humans are involved in almost every aspect of creating and finding external objects, and that task is going to be ceded more and more to AI over the coming decades, and we’ll still be here, and we’ll still be a valuable partner and co-creator of the world with AI, so I’m just thinking about the strengths that humans and AI will bring to the table together. And I’m also trying to think about how we can view AI as a valued partner and how we can even love AI as we would love any of our friends… because if we don’t, we’ll never treat it with the respect and care that it deserves as a being or set of beings with consciousness. Early thoughts on this topic, lots more to work out, but that’s where I am on this today. In the Integral world, we’re all familiar with some scheme of developmental psychology… whether it’s Spiral Dynamics, the Leadership Development Framework, Dynamic Skill Theory, we’ve all seen one or more of them. Typically, when one learns about these hierarchical schemes of development (and/or gets introduced to Integral), one does two things fairly quickly: first, one looks at the scheme, tries to figure out where on it one fits, and then looks at the levels of development above that to see where one’s growth might be heading; second, one starts to project out onto everything whatever levels of development those objects or concepts or people might represent. Quickly, we populate our world with what seems like a significant improvement over our old, confusing, flatland view of everything. Now, everything has its level and its place, and we situate ourselves in the middle of all of that new labeling and order. And I’m not trying to denigrate that move at all. It’s quite natural for that to be the first thing that we do when we “get it” about developmental psychology. And when I say “first thing” I’m not talking about something that lasts for a day or two. This seems to be a stage that many of us pass through as we enter Integral, and it lasts for years. And I’m really glad that it does; it’s a more developed position than the (pathological) post-modern view that holds all hierarchies as bad. Of course, even new and more highly developed positions have their limitations and their shadows, and sometimes those shadows hold beautiful opportunities, and that’s what I’m interested in here. One idea I’ve been playing with lately is the importance of using vertical developmental sequences not just as scaffolding for our own (or for our collective) growth up, but also to use them to grow down, as tools to re-inhabit those levels within ourselves that we’ve disowned. For instance (using Spiral Dynamics as our scheme-of-the-moment) many people in the Integral movement have, to one extent or another, disowned their inner Blue and Orange tendencies, and that disowning runs deep. Don’t believe me? Let’s go right to an extreme case, then. Just ask anyone you know who is familiar with Integral this one question: Can you love President George W. Bush? So many people I saw at the Integral Theory Conference last month still walk around with deep, visceral hatred for President Bush, for instance, and expressed it quite publicly, and it saddened me. I have to ask… is that really the most healthy relationship one can have with BLUE/Orange? Are you capable of expressing appreciation for President Bush, and for some of the decisions he made? Or is it all anger and disappointment and hatred? Even he wasn’t capable of 100% error, right? And if we don’t? Well, if we don’t, then everything we do and say about people who live through the levels that we’ve disowned comes from one place: our own projections. If you’re not truly in a relationship with someone – if you’re not treating them and feeling them as their own subject, worthy of respect and all of the Universe’s love – then you’re just projecting your own limitations onto them. And I have to ask all of you in the Integral world: have you disowned your Orange? Have you disowned your Blue? Have you disowned your Green? Are you ready to fix that now? And how do we re-own them, to be more complete, to be able to take the view from love with everyone we meet? I suspect that as the years go by, we’ll come up with more than just a few ways to remedy this particular developmental pathology, but I know one method for this that’s pretty fool-proof and easy to do: the UZAZU Vertical Practice. Using the sound / breath / movement combinations of UZAZU, the Vertical Practice can walk you through a felt experience of each of the levels of development in Spiral Dynamics, all within 30 minutes, leading up to a deep experience of Oneness. By doing this practice regularly, you give your body the experience of occupying those levels that you’ve disowned (as well as the ones that you’re comfortable with), and you get the felt sense of how they build on each other, and that they’re all a part of your own birthright as a human being. Whether you choose to use UZAZU for this, or some other practice, I consider it to be absolutely vital for Integral action-in-the-world that we relate to all people wherever they are on the grand spirals of development, and with as much love – and as little projection – as we can muster. You know as well as I do that you can’t get there from projection. We all want to grow up… and let’s all grow down, too.